joji Ken Muramotoʼs train art blends his fascination for trains with his love of art. 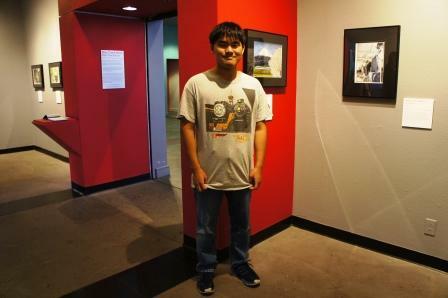 Ken’s first solo show at the Santa Cruz Museum of Art and History (MAH) “One Track Mind” was a big success. Ken received many positive comments and encouragements. We thank those who visited the show. Here’s some comments from the guest book. Special thanks to Marla Novo, Curator of the Collections, and Justin Collins, Exhibitions Manager, both of MAH, for creating such a wonderful space for Ken’s arts. Ken’s original train arts are being displayed at the Santa Cruz Museum of Art and History along with Toy Trains 2014 exhibition http://www.santacruzmah.org/2014/toy-trains-2014/ from now till January 11, 2015 (EXTENDED!!). The Museum is open 11-5 from Tuesday to Sunday. It closes on Mondays, Christmas Day and New Year’s Day and closes early at 3pm on Christmas Eve and New Years Eve. Ken and his family will be there between 11am and 12pm on Friday, December 19th and some other times during the exhibition. Please visit and enjoy his beautiful works of art! Ken Muramoto’s train arts are featured in Orchard Supply Hardware® (OSH)’s 2015 Train Calendar, which will be available at OSH stores across CA and OR from Friday, November 28th, 2014.